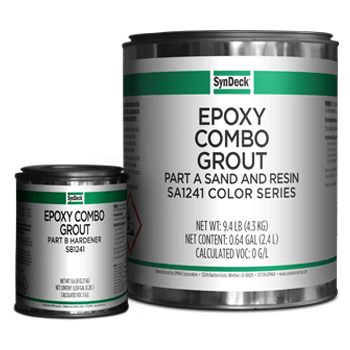 SynDeck® Epoxy Combo Grout SS1241 is a two-component marine epoxy grout. It is combined with specially selected filler sand to produce a quality ceramic tile setting and grout material. This product works well as both a setting and finishing material for porcelain, stone and quarry tile. It features outstanding chemical resistance and thermal cycling capacity. SynDeck Epoxy Combo Grout has no unpleasant odors when components are mixed and clean up is easy with water.